Sign up to receive a copy of Health News delivered directory to your home! 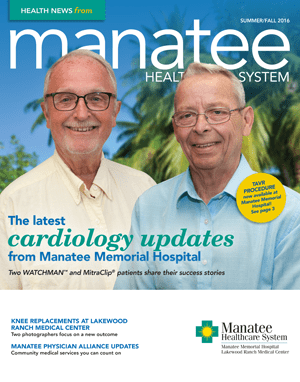 Health News from the Manatee Healthcare System is a publication designed to bring you the latest news as well as health and wellness information you can use throughout the year. You can read the latest issue here, or sign up to have Health News mailed directly to your home. In his mid-40s, Herb started having problems with his right knee. “Photo shoots can be tough – climbing ladders, hauling equipment, a lot of bending – it’s very hard on the knees,” says Herb. “When expecting moms and dads see their nurses, doctors and members of other hospital departments working harmoniously together as a team, they know they can count on us..."
Srinivas Iyengar, MD, Daniel Friedman, MD, and Eugene Parent, MD performed the first WATCHMAN™ implant procedure at the Valve Institute at Manatee Memorial Hospital.